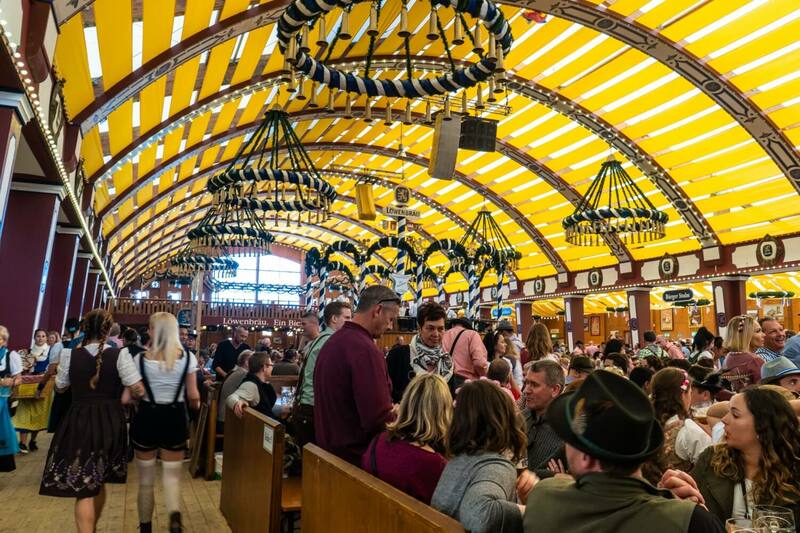 When it comes to getting table reservations at Oktoberfest, the amount of misinformation out there is hilariously unhelpful. The truth is, most articles will try to sell you on expensive packaged tours, or otherwise skimp out on important details like when and HOW you actually make these reservations for yourself. So, frustrated and tipsy (the name of my autobiography, really), I busted out my Google translate and pawed through a cesspool of broken links, redirects and confusing German reservation systems, all to bring you this step by step, no BS guide to securing table reservations at Oktoberfest (whether you’re a local or a tourist). So, are you hoping to snag a reservation for this year’s Oktoberfest? Not all the tents have opened up for bookings yet, but some have, so get to it! 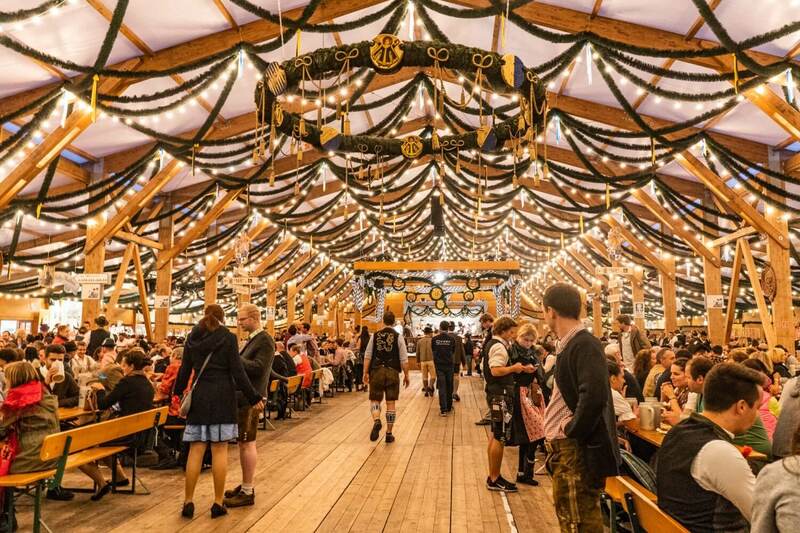 Hopefully this guide will help you get the Oktoberfest table reservation of your dreams. 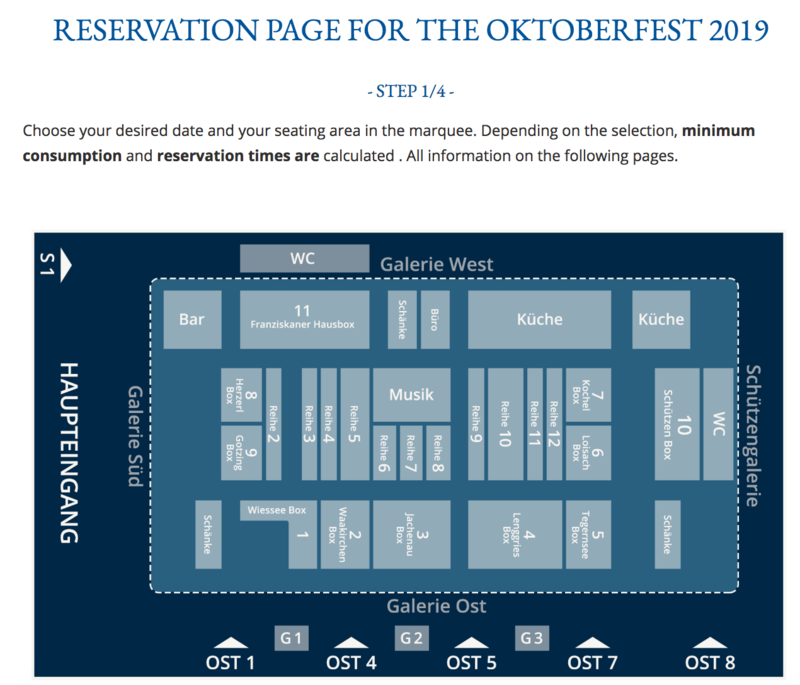 Below, I’ve broken down the individual reservation system step by step for 16 of Oktoberfest’s biggest tents. Enjoy! 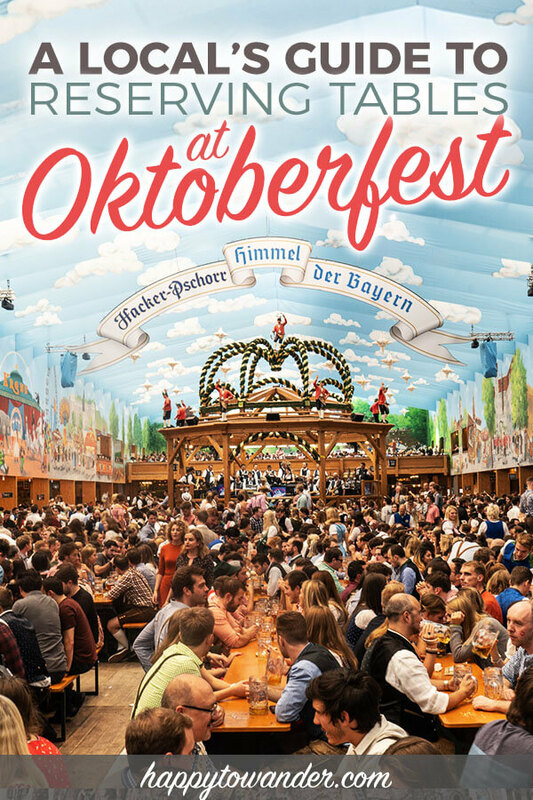 First: Do you need Oktoberfest Tent Reservations? Any other questions about Oktoberfest reservations? The short answer? No, not really. Unless you’re a big group of people and you want to make sure you get a full table together, then I wouldn’t be too stressed over getting a reservation. It’s still 100% possible to have an awesome time since the tents are all free to enter and they save a portion of the tables for walk-ins anyway. 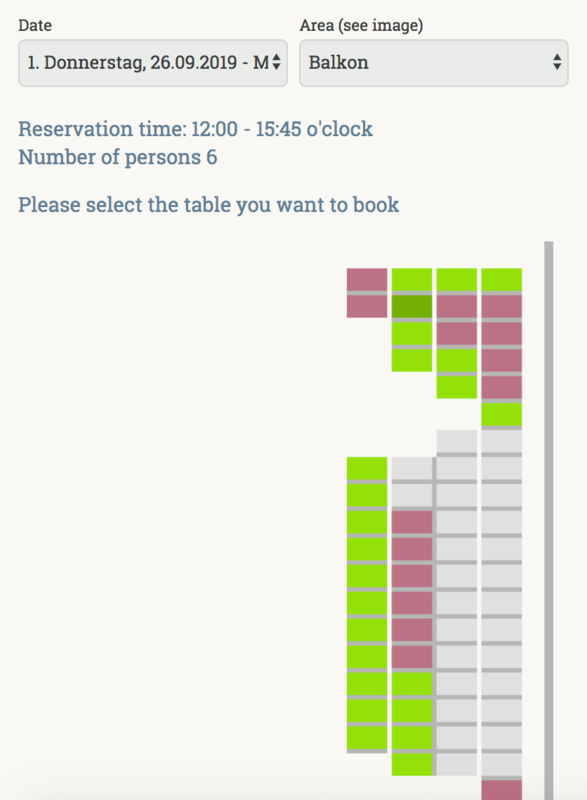 If you’re smart, arrive early and plan to visit during off-peak periods like weekdays, then you’ll have no trouble finding a table to slot in, even without a reservation. I explain a bit more in this Oktoberfest “tickets” guide. But hey, having a reservation at Oktoberfest certainly doesn’t hurt, and it can help you do the trip on a budget (through dodging expensive 3rd party reservation sellers). So, I’m hoping this guide de-mystifies that process a little! It’s surprisingly simple if you know where to look and when to start booking. With that said, let’s get to the reservation process. See those happy people drinking? That could be you! 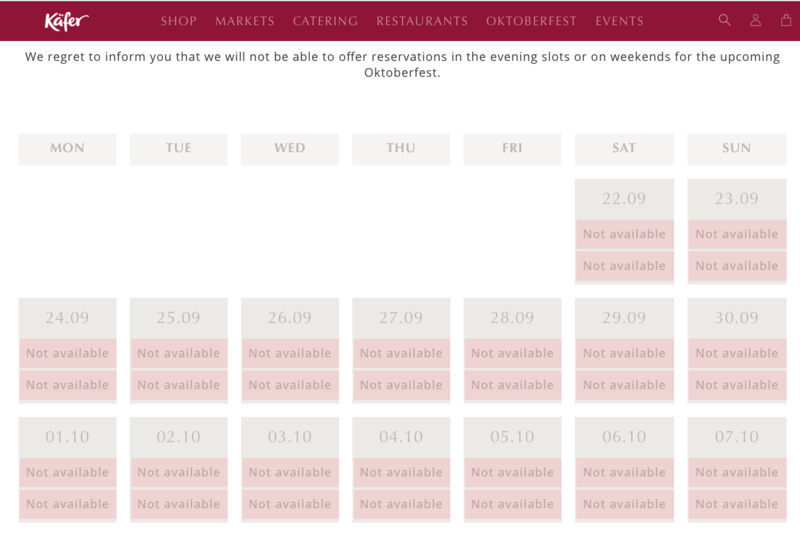 For the most part, there’s no such thing as making an Oktoberfest reservation for 1 or 2 people. When you commit to reservation at Oktoberfest, you’re committing to booking out the entire table which seats 8-10. That said, what you’re REALLY committing to is paying for enough food/drink to feed 8-10 people. 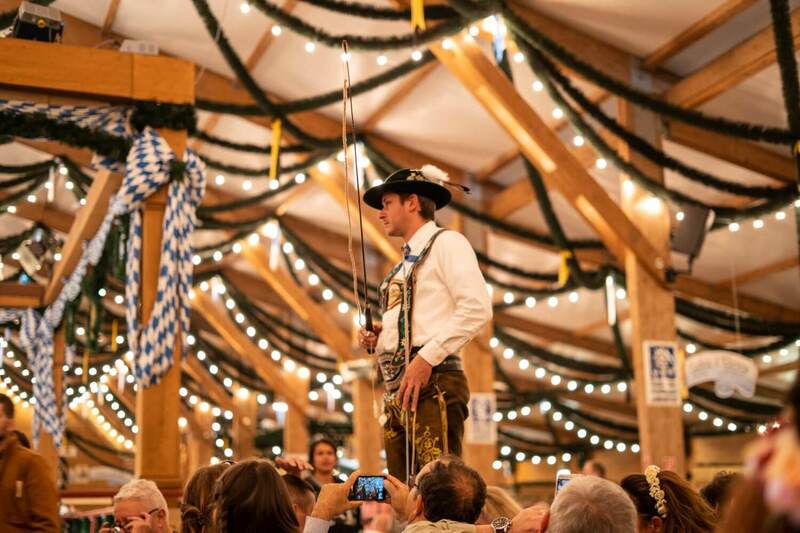 That’s because to hold your reservation, you need to pay a minimum consumption amount beforehand which is then given to you in the form of vouchers to spend throughout Oktoberfest. If you are a party of 4 but are happy to pay for 10 people’s worth of vouchers, then you can, in theory, still reserve a table. NOTE: Käfer’s Wies’n-Schänke offers reservations for smaller groups, but only for lunch. This is a really nice “tent” but it doesn’t offer the traditional Oktoberfest tent atmosphere – it’s more like a cozy little ski chalet where you can enjoy gourmet food… so it’s nice, but if you want the classic ‘dancing on benches’ Oktoberfest experience, you should book elsewhere. I mentioned this above, but just to be clear: while it doesn’t cost anything to reserve a table at Oktoberfest, you DO need to pay a minimum consumption per person upfront (or once they invoice you, usually sometime from June onwards). For a full table, this adds of up to hundreds of euros. While researching for this article, I’ve noticed (rather consistently) that most of the tent’s official websites have outdated information and broken links when you browse the English versions. For many of the tents where reservations are already open on the German language part of the site, forms aren’t even available or bring up a “404 error” on the English sites. So, keep that in mind when browsing – the German versions of the sites are the ones you want to be on to get the most up-to-date info. Last but not least, if you’re currently living in Munich, that makes you eligible for a special class of tables that they call the München-Kontingent tables. Several tents offer them. So far, Marstall Festzelt and the Ochsenbraterei have already announced how they’ll be handling these bookings for 2019, and you’ll find those details in their respective sections below. 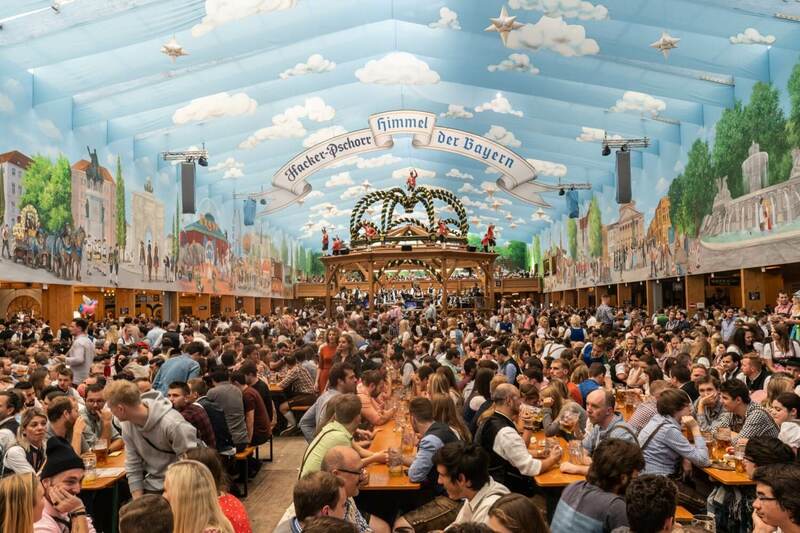 BUT in previous years, many of the big tents offered them, including the ever-so-exclusive Augustiner Festhalle. Long story short, these are special tables reserved for people who live in Munich. Generally, they’re special tables available during peak times like weekends that you can reserve for a small fee (10 or 20 euros for the entire table, depending on the tent). Tables are assigned on a first come, first serve basis and based on previous years, they are usually reserved by going in-person to the tent’s respective offices. The best part? You don’t need to pay for vouchers upfront – just the reservation fee. NOTE: These tables are usually not released until May-June, so hang tight. Again, details are added for these tables below if they’ve been made publicly available, and I’ll be regularly updating this list as I learn more. Alrighty, let’s get to the good stuff. As I mentioned earlier, every tent at Oktoberfest has its own separate system set up for reservations, which means every tent starts taking reservations at different times of the year and has a different system in place. 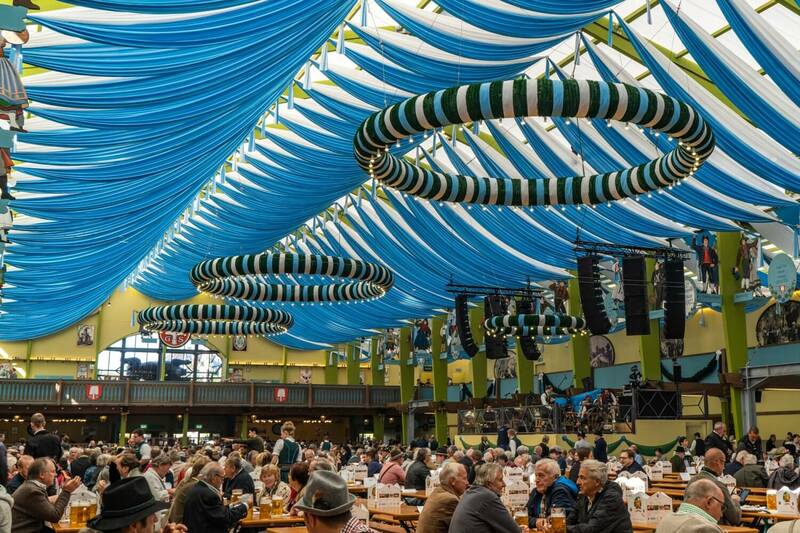 Here are the reservation systems step by step for 16 of the biggest tents at Oktoberfest. There are a lot of smaller tents too that handle reservations differently, but then this article would be ten million words long. 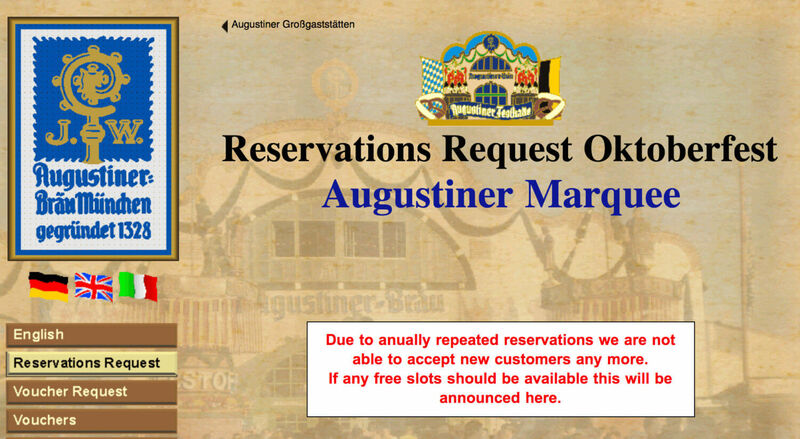 Anyways, in alphabetical order, here’s how you make Oktoberfest table reservations for each tent, along with important info like WHEN reservations open and how reservations are made. You can read a full breakdown of the different tents/their vibes in this post. According to the tent’s official website, reservations for the Armbrustschützen-Festhalle will only be taken from April 1st onwards and they’ve said on their official website that they won’t honour any requests that come in before that. Basically, you can request a reservation by fax or by post, with certain dates bookable through this online form. Some time slots are also blacked out/fully booked already, but they’ve provided this colour coded chart to help you understand. 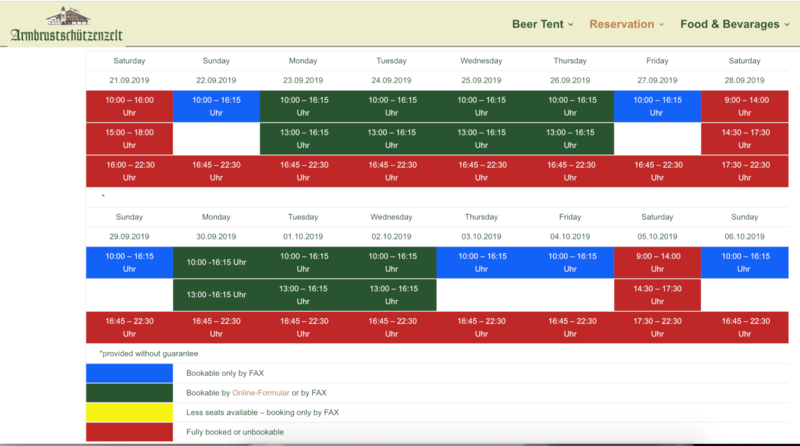 Green slots are bookable via the online form or fax/post, blue and yellow slots are bookable only by fax and post, while red ones are fully booked or unbookable. Where to send your reservation request: 089/23703705 or by mail to Sparkassenstr. 12, 80331 Munich. NOTE: Processing time is said to be about 4 weeks, so if you don’t hear back, hang tight! No I’m not joking – you actually can’t. This is definitely one of the most popular tents among locals at Oktoberfest, and they’ve announced that they have so many repeat reservations (i.e. people who reserve every year) that they aren’t able to accept any new customers. You can keep an eye on their official website here in case anything changes, but I wouldn’t get my hopes up. 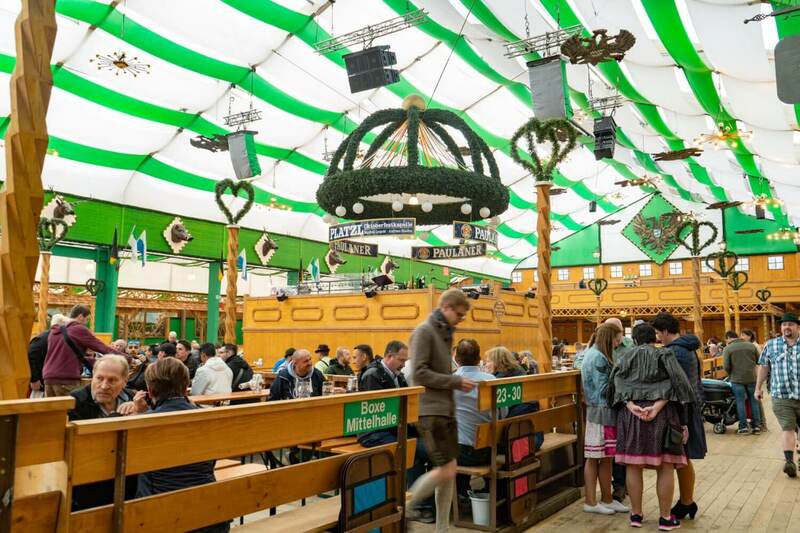 Special notes: This tent is located in the “Oide Wiesn” part of Oktoberfest which has a 3 euro admission fee, but your reservation package will come with entry bracelets. Bracelets and tickets are sent by mail in August after payment is received. The website for the Festzelt Tradition tent hasn’t yet been updated for 2019, but they have detailed information from last year so I’m going to assume things will be similar this year. 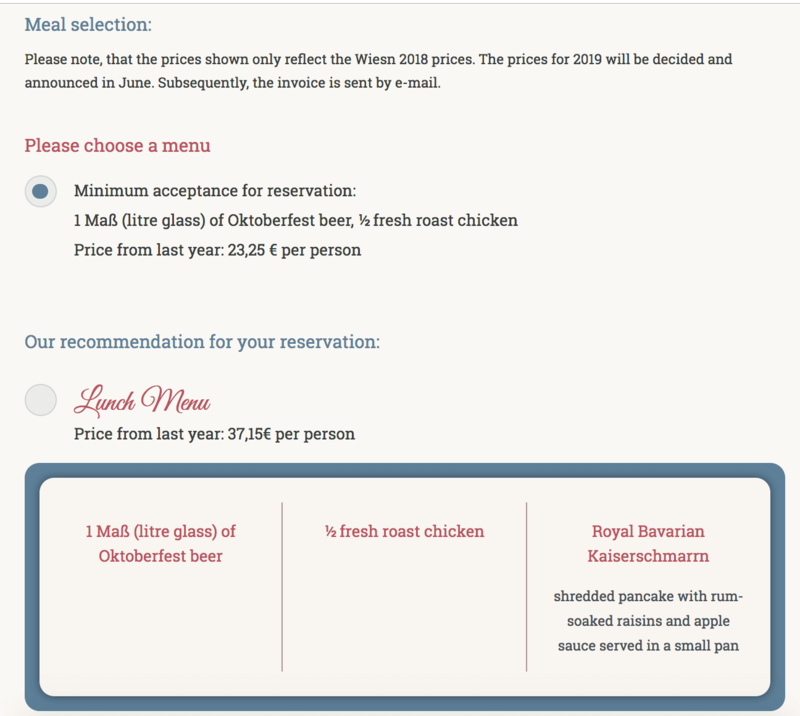 Reservations for the Festzelt Tradition (when they do open) can only be made either through their online form (accessible here) or in-person at the Ratskeller restaurant in Munich’s Marienplatz on certain dates. Last year, these dates were Thursdays and Saturdays from Saturday, July 28, 2018 to Thursday, September 13, 2018, from 10 am to 6 pm. One of the prettiest tents at Oktoberfest! Details are scarce for the 2019 reservation process at Fischer Vroni, but what we do know based on their official website is that more info will be released in May 2019 and this year, online reservations will not be possible. Details have not yet been released for 2019, but based on the FAQ page, here’s what we do know: reservation requests are only processed via their online form and through their reservation page which is updated frequently once they open up for “new inquiries” in March. That means that people who have had reservations in the past (“repeat customers”) get first dibs. It’s a little complicated though: you make your reservation request, then you get an email within a few days to confirm it, BUT the reservation isn’t binding until you actually pay for your vouchers, which takes place in July. Apparently, you are sent a voucher order form in mid-June, where you need to request a bill for the vouchers, and must pay within 14 days, otherwise you lose the reservation. Last year, if you didn’t pay up by July 23, you forfeited your reservation, SO remember, even if you get through the online reservation system, your reservation isn’t confirmed until you actually pay for your vouchers. Reservations open in March for this super popular tent! Special notes: This is a very small tent and it’s located in the “Oide Wiesn” part of Oktoberfest which has a 3 euro admission fee, but your reservation package will come with entry bracelets. Bracelets and tickets are ONLY available via mail, and will be sent to you after you’d paid your invoice. 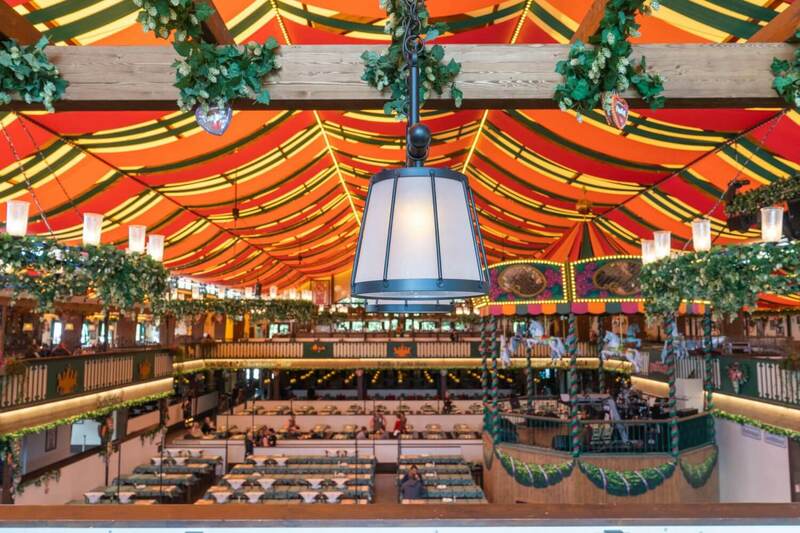 Details haven’t yet been released for 2019’s Herzkaspertzelt’s Oktoberfest tent, but given that it’s a small one, it’s likely there won’t be a lot of free slots for reservations. When the opportunity to reserve does come up though, bookings will be made online only or on select days by calling “Frau Neubert” as per their contact page on Thursdays and Fridays from 10am-2pm at 089 – 45 21 50 57. NOTE: This process is taken directly from the tent’s official website here. STEP TWO: Wait for either a reservation confirmation or a ‘rejection’ via email, which takes up to 6 weeks. STEP FOUR: Wait for your invoice which will be sent in June. You must pay within 14 days of receiving the invoice. Apparently you can also pay in-person with cash or EC card, and vouchers can be mailed within Germany if you’ve paid in July or August. STEP FIVE: Pick up your vouchers after your payment has been received. Up until early September, you can get them from their city ​​office (Hofbräukeller, Innere Wiener Str. 19, 81667 Munich) OR otherwise, you can pick up your vouchers in the tent office when you actually arrive at Oktoberfest. NOTE: Based on the Reservation page (currently showing all the full 2018 bookings), you’ll be able to click on time slots when appointments open on March 1 and presumably, you send an email from there. The “Rules” page is pretty clear on reservations being email only. 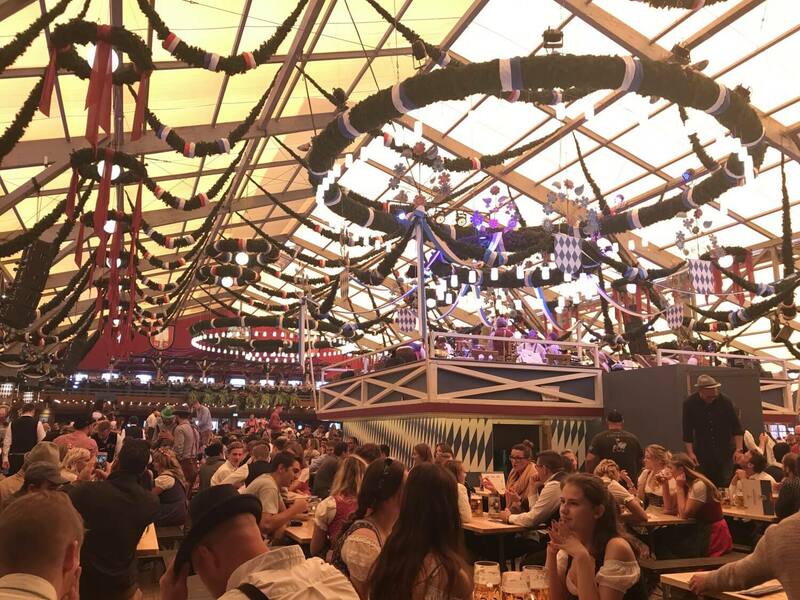 This is by far one of the most exclusive tents at Oktoberfest, and is known for being the “celeb” hang-out – a cozy, intimate tent with gourmet food options. It’s so exclusive in fact that reservations aren’t even allowed in the evenings and weekends. BUT, if you want to get a taste of the Käfer’s Wies’n-Schänke tent, the process is simple. Reservations are released on April 1st for new customers, and basically you go on the online form here and select three time slots that you’re interested in, how many of the above dates you’d like to book (1, 2 or 3) and finally, your contact info. 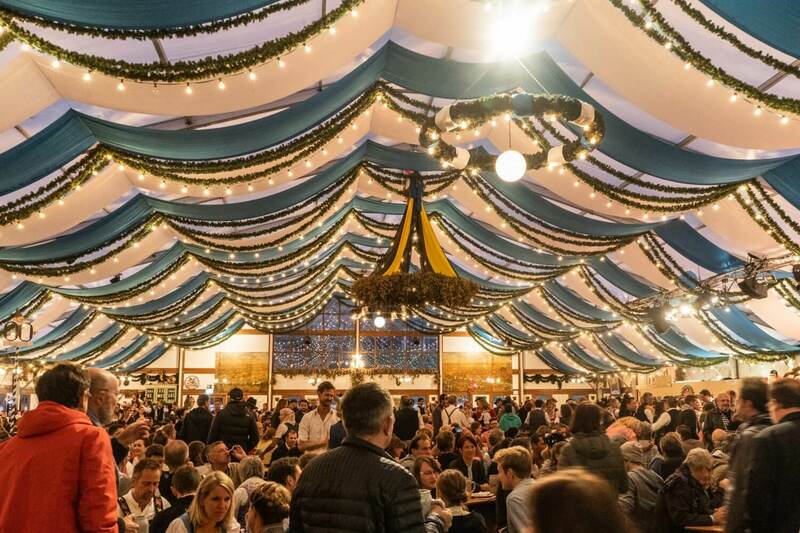 The reservation process for Oktoberfest’s cozy wine tent is already open for 2019 and is surprisingly simple. All you need to do is visit the GERMAN version of the Reservation page here, enter your contact information and then choose the time slot of your desired reservation, along with the number of people you’re reserving for. This by no means secures your reservation though – you’ll need to wait for an official confirmation, but it’s a straight-forward, electronic process! The prices you see correspond to the amount of vouchers you’re required to purchase, so for example, it’s small amount (10 euros) if you’re popping in for lunch on a Monday, but it’s way more if you’re booking for a Sunday evening until closing time (80 euros). NOTE: Assuming you are a new customer, make sure you press the “Reservierung ohne Kundennummer – Neukunde” menu which is for new customers with no prior reservations made at this tent. While no reservations can be made in the evenings or weekends at Löwenbräu-Festhalle, their process for weekday afternoon table reservations is relatively straightforward. According to their official website, reservations for Monday – Thursday lunch slots (12-4:30pm) can be made by emailing [email protected] from March 4 onwards. 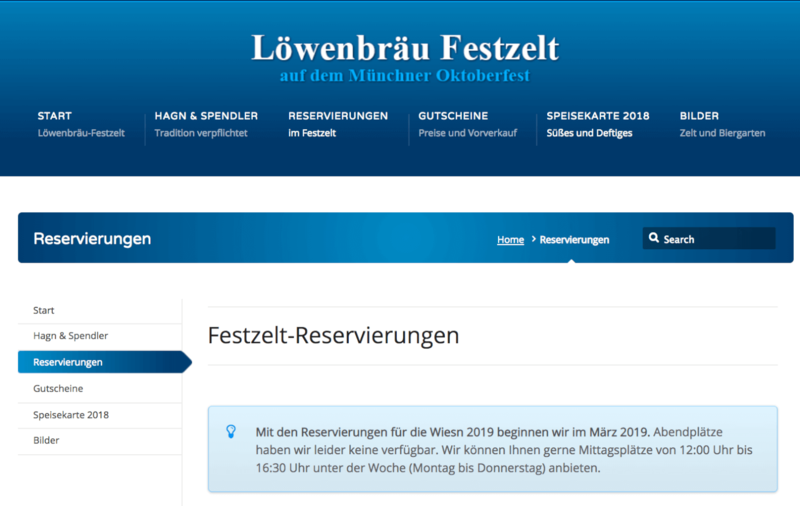 When reservations for the Marstall Festzelt open at the end of March, requests can be made ONLY through the online form on their website (or in person if you live in Munich and qualify for their “München-Kontingent” tables, but more on this later). STEP ONE: Starting at the end of March, you can submit your reservation request through their official online form which shows the dates they have available. STEP TWO: You have to wait to hear back – processing can take up to ten weeks. If they have space for you, you’ll get an offer via email which you can accept through a special activation code. The confirmation and payment request will come to you via email by the end of May at the latest. STEP THREE: Once you receive it, you must then pay your invoice amount via bank transfer. STEP FOUR: If you live in Germany, Austria or Switzerland, your reservation package will be mailed to you at the beginning of August. Otherwise, you can pick up your vouchers, etc. on the day of the reservation at the office in the tent. If you live in Munich, you may be eligible for what they call their “München-Kontingent” tables reserved solely for Munich residents. For Marstall Festzelt, reservations for these special tables must be made in person at their office (Lindberghstraße 4, 80939) from July onwards (exact date TBA). Reservations are taken until all the spots are claimed. For this, you must pay in cash or debit card and you pay a processing fee of 20 euros. To save time, you can download the reservation form in advance on their official website. Look at how pretty the tent is though! STEP TWO: Wait until June, at which point you’ll get an email back regarding whether or not your reservation request has been accepted. STEP THREE: If your request has been accepted, you must fill out the attached order form for vouchers and send it back via email or fax. Remember, vouchers must be paid for by the beginning of September or you forfeit your reservation. STEP FOUR: Wait for your vouchers to be mailed to your address in July, or you can pick them up at their city office from end of August to early September OR pick them up in-person once Oktoberfest begins. STEP ONE: Wait for München-Kontingent bookings to open by the end of May and then send an email to [email protected] with your Munich address, contact person (in this case, also your pick-up person) alongside your email address to confirm the reservation. STEP TWO: If your booking is successful, then you must go in person to their office at the end of August/early September (exact dates TBA) and pay a ten euro processing fee in CASH to secure your reservation. A little known secret is the Ochsenbraterei actually has special tables they release a day or two before the actual dates that you can book instantly online. They call these their “Spontan-Kontingent” and you can find them through the “Spontan-Kontingent” tab on the GERMAN version of the Reservation page here. This is probably the best way to secure a last-minute table. STEP TWO: Wait to hear back. If successful, you should get a confirmation in April with your specific terms and conditions. Otherwise, you are put on a waiting list and will be notified if you can be accommodated. STEP THREE: Wait until June, at which point the collection/shipment of vouchers will be ready. 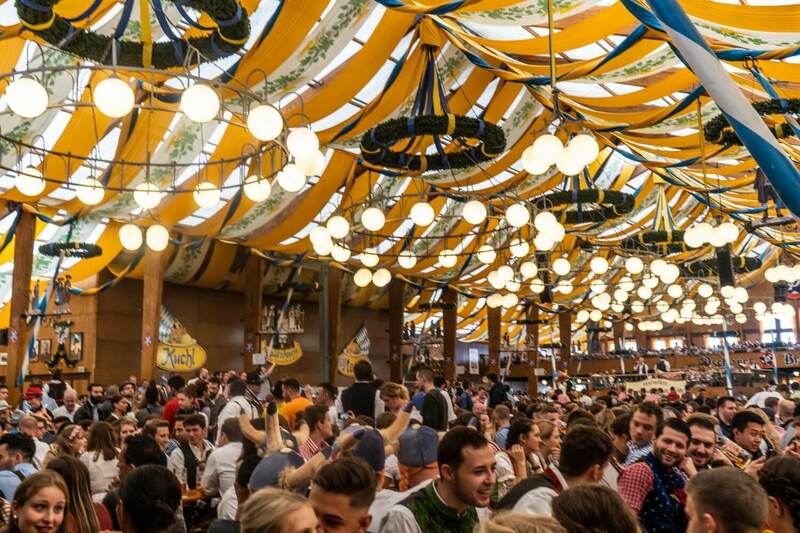 For what it’s worth, this is by far the easiest, least stressful system of making Oktoberfest table reservations, so if you want something stress-free, go for this one. As of writing (Feb 2019), there are still LOTS of tables, and you get immediate confirmation, so no waiting game. STEP TWO: Select your desired date and then look for green tables which are available. Click on the table you want to reserve. STEP THREE: Select your meal option. If you’re not sure how much you’re going to eat, just go for the minimum (usually 1-2 1 Maß and a half chicken depending on the timeslot you book for). Final 2019 prices won’t be confirmed until June, but they give you an estimation of prices based on last year. STEP FOUR: Enter your contact information. STEP FIVE: Happy dance and wait for your confirmation! You’ll be invoiced in June once prices are solidified. Be sure to pay as soon as you receive the invoice so that your reservation can be 100% confirmed. NOTE: For all its convenience, this is one Oktoberfest tent that DOES charge a fee for reservations, but don’t worry, it’s only 1 euro per person. STEP ONE: Head over to their online reservation system here and select your desired date, time slot, number of tables, etc. STEP TWO: Choose your desired food options. FYI, when I was testing the system, it was a little weird and required you to input a number for every field, even if it’s zero, so let’s say you’re not interested in a bottle of schnapps, you actually need to put “0” in the field instead of leaving it blank. STEP THREE: Enter your personal information and submit your request. STEP FOUR: Wait patiently for an email confirmation, and then (if successful) watch out for your invoice coming in June. Pay it ASAP to secure your reservation. 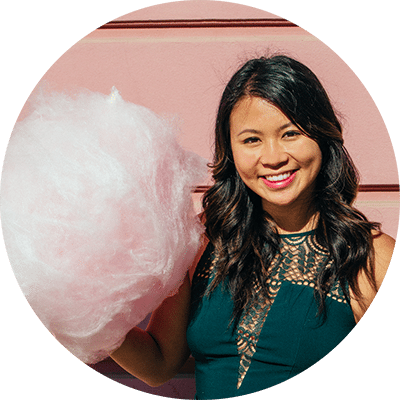 I hope you enjoyed that step by step guide to scoring a table reservation at Oktoberfest! Good luck and have an awesome time at Oktoberfest! Oktoberfest has been on my bucketlist for so long. It seems a little complicated/intimidating but this guide is so helpful. So many useful tips and suggestions. Thank you!! How complicated! Once the teens are at University we shall be heading to Munich so thank you for this!